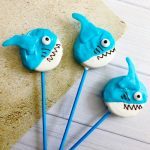 These Shark Marshmallow Pops are easy, tasty and fun! 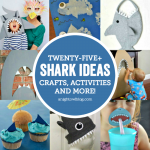 The perfect #SharkWeek or shark party treat for the kids or shark lover in your life! Hi friends! We’re well into #SharkWeek, have you been watching? My boys are glued to the tv to get their shark fix in. 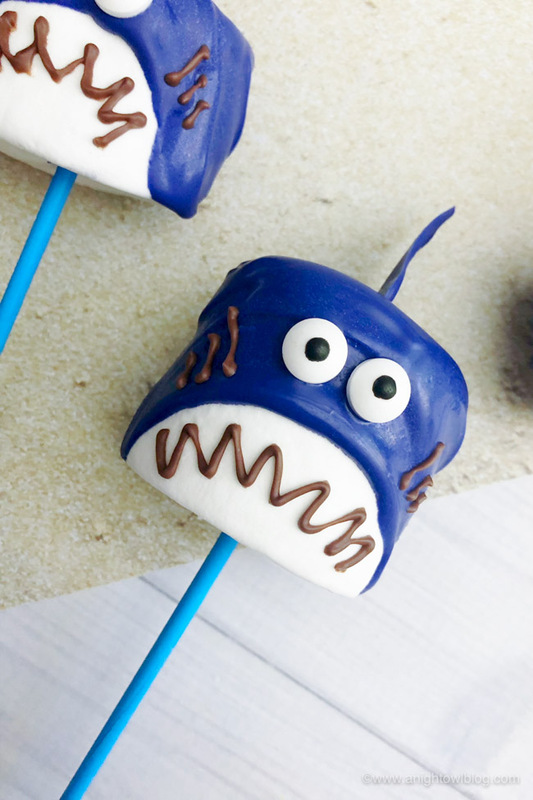 And because we love to make shark themed treats, like Shark Oreo Pops, Shark Frenzy Ice Cream and Shark Chumsicles, we thought we’d keep the shark treat train going with these adorable and easy Shark Marshmallow Pops! If you don’t have Oreos on hand or your kids just like those marshmallows a little more, these treats come together so quickly and easily! 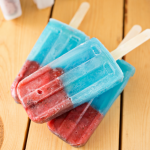 How do you make marshmallow pops? 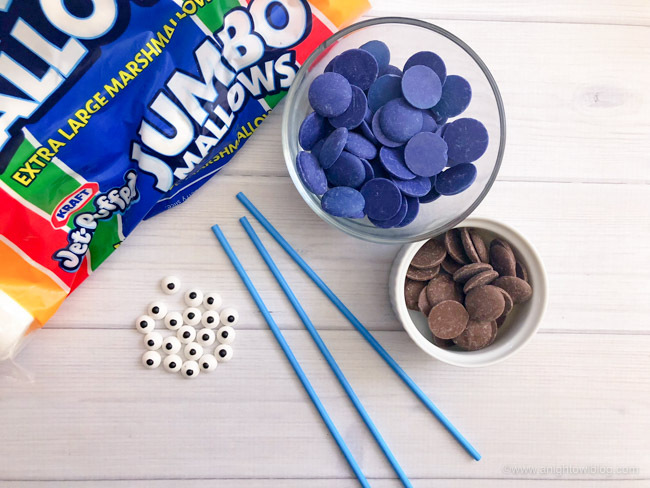 Marshmallow Pops are simply jumbo marshmallows on a lollipop stick that you decorate. Seriously, that easy! They make cute party treats or favors too. 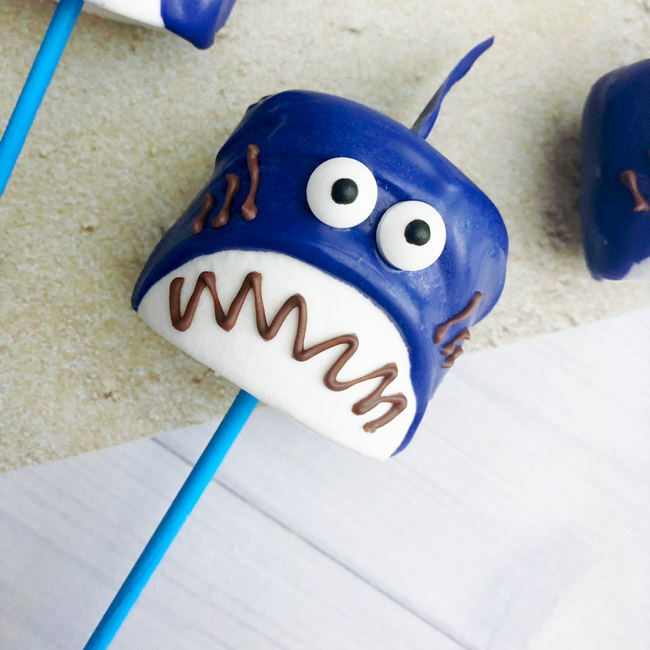 So here’s how we made the cutest Shark Marshmallow Pops! 1. 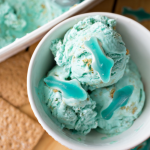 In a small microwave safe bowl, heat 2 cups of the blue candy melts on 50% power for 3-4 minutes, stirring every 30 seconds until melted. 2. Stick a lollipop stick into the bottom of a marshmallow. 3. 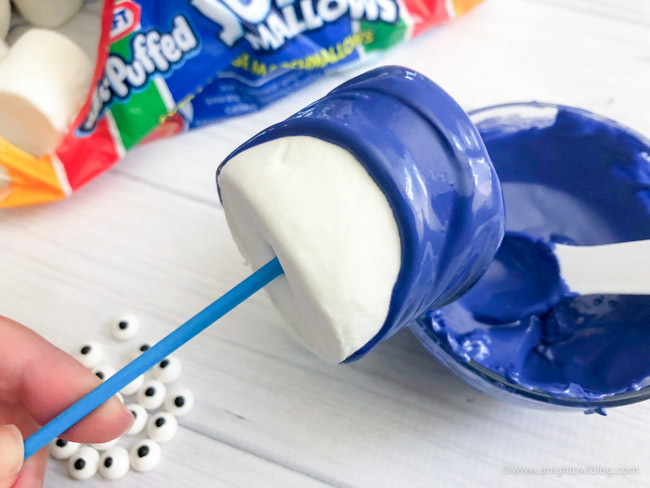 Use a spoon to cover the back, top and part of the front of the marshmallow in blue melted chocolate, leaving just a half oval bare on the bottom front of the marshmallow. 4. Stick 2 candy eyes onto the front top of the blue marshmallow, set on parchment paper and transfer to the freezer for about 5 minutes or until the chocolate has hardened. 5. Pour a small amount of the blue melted chocolate into a decorating bag and cut a small tip off the end. 6. Use the bag to draw 1.5” shark fins onto a piece of parchment paper and transfer to the freezer to harden. 7. 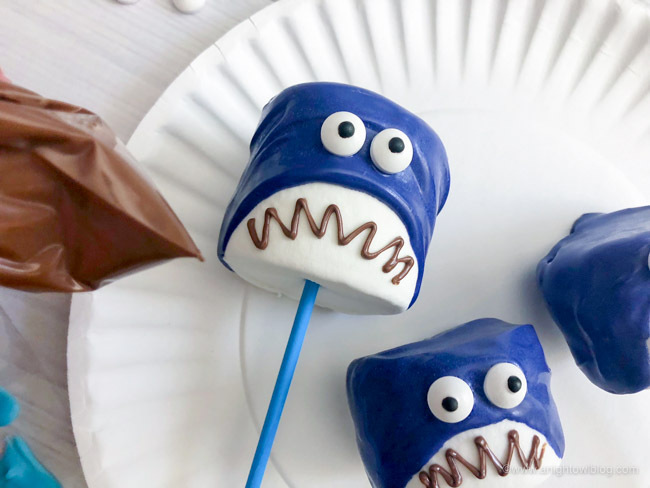 Carefully peel the fins off the paper, dip the bottom into the melted blue chocolate and stick onto the top of the shark marshmallow. 9. Use your decorating bag of light cocoa candy melts to draw on zip zag teeth on the bottom white of the marshmallow and a few lines on the sides of the eyes. There you have it! 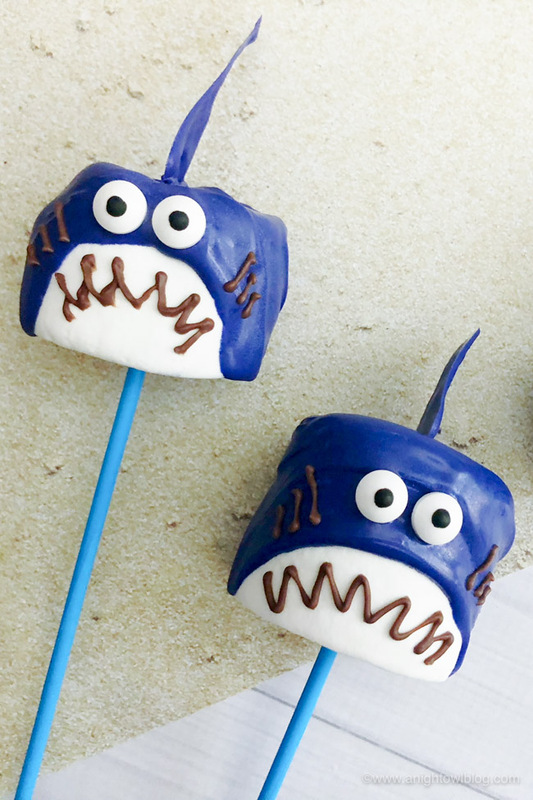 Aren’t they just the cutest Shark Marshmallow Pops you ever did see?! Let us know if you make some, we’d love to see your pics!